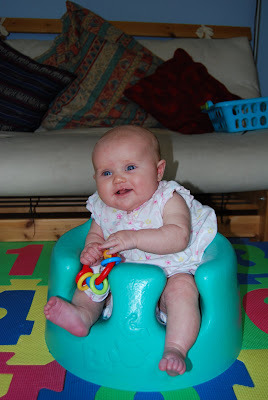 ThingTwo's head control is now good enough that she can sit up in her Bumbo. Not sure how much she enjoyed it. She seemed to like the novelty of being able to sit up without being held. ThingOne wanted to "pretend" it was a potty, and I didn't fancy finding out how much of her imagination she was planning to use. 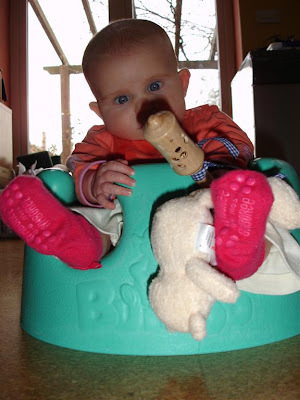 For comparison, here's an old photo of ThingOne in the Bumbo, also at three months old, weilding a rattle like it's a light sabre.